Prior to purchasing I read through several reviews and one issue that repeatedly appeared in comments was that the scale had a tendency to provide different results across multiple readings done within minutes of each other. That does appear to be true. I don’t know if the scale is slightly inaccurate, or just overly sensitive. Regardless, it doesn’t really seem to be much of an issue for me. I’ve had standard scales in the past that tended to fluctuate just as much. 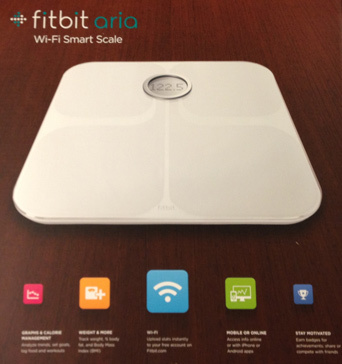 The core feature of this scale is that it can connect to a wireless network and upload measurements to the FitBit Website. Indeed, it does do this and it seems to do it well though there is one important drawback that shoppers should be aware of: it only connects on 802.11b. For most individuals this won’t be a problem. Currently it’s typical to have a router that supports 802.11b/g mixed modes. However, anyone hoping to use this scale with an 802.11g or 802.11n only wifi network won’t be able to. If you’re hoping to integrate this to an 802.11n/5 GHz network it’s not going to happen with this model. The device is able to recognize up to eight FitBit users. I didn’t have much trouble assigning my measurements to my account and it’s recognized me every time since. However, my wife has yet to use it so I don’t know just how smart it really is about detecting different users. Updated 10/28/2013: It continues to work as expected. In the end it’s just a scale with a couple of nice features so I can’t really add more than I’ve already written.